What is the next trend -- the next "killer app"? This question is very much on the mind of Ursula Van Urden, a burned-out art student who, after her supermodel sister Ivy's widely publicized suicide attempt, has found work as a trendspotter for Tomorrow, Ltd., in the volcano-shadowed metropolis of Middle City. Armed with only a sketch pad and a mandate to "find the future," Ursula discovers a homeless girl who hunts her own food and lives on the street. This "savage girl" becomes Ursula's first trend and the basis for an advertising scheme that goes madly, disastrously awry. 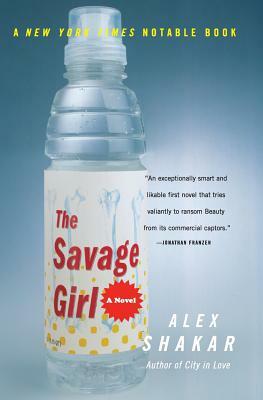 An exceptionally written novel that puts an obsession with pop culture under the microscope, The Savage Girl is a book that cannot be ignored, and Alex Shakar is a writer brimming with talent. Alex Shakar is the author of the story collection City in Love, which won the 1996 National Fiction Competition and was published by The Fiction Collective. It was an Independent Presses Editors' "Pick of the Year." Shakar graduated from Yale University in 1990, was a Michener Fellow at the University of Texas at Austin, and is now pursuing a Ph.D. in English and Creative Writing at the University of Illinois at Chicago.